Charlize by Jon Renau is a breezy and beautiful, easy-to-wear pixie that frames the face with feminine layers. Weighing only two ounces, the O’solite open cap construction is feather-light and provides maximum ventilation for all-day comfort. 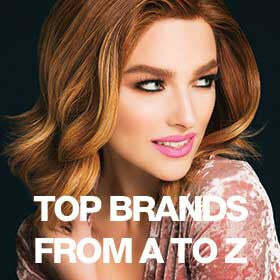 The synthetic hair is pre-styled and ready-to-wear. This short and chic wig has amazingly natural lift and volume. Synthetic Hair – ready-to-wear and designed to look and feel like natural hair. Open Cap – open wefting allows superior ventilation for maximum scalp cooling. Ear Tabs –bendable, allowing for a smooth, comfortable and contoured fit. Approximate Length: Front 5" | Crown 6.25" | Sides 5" | Nape 2.5"